“Yes,I know you do, but I do not like it! And it is boring, sad, always the same ..” protested the girl, looking gloomily at the black and white cookies on the table. The mother picked-up the colored glaze, a beautiful bright and warm shade of red. 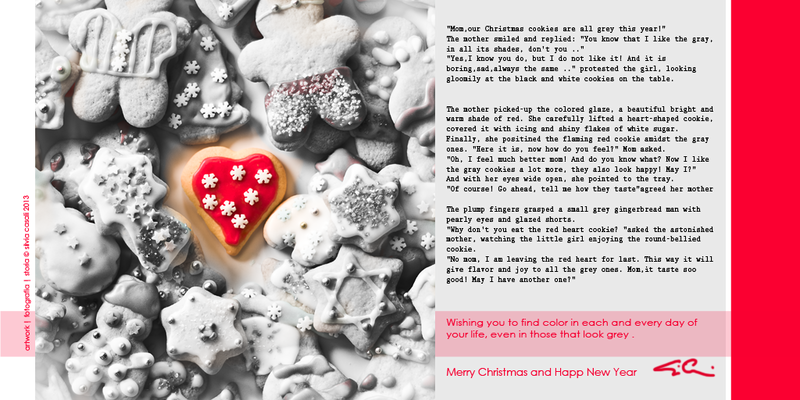 She carefully lifted a heart-shaped cookie, covered it with icing and shiny flakes of white sugar. Finally, she positioned the flaming red cookie amidst the gray ones. “Here it is, now how do you feel?” Mom asked. “Oh, I feel much better mom! And do you know what? Now I like the gray cookies a lot more, they also look happy! May I?” And with her eyes wide open, she pointed to the tray. “Of course! Go ahead, tell me how they taste”agreed her mother. The plump fingers grasped a small grey gingerbread man with pearly eyes and glazed shorts. “Why don’t you eat the red heart cookie?” asked the astonished mother, watching the little girl enjoying the round-bellied cookie. Wishing you to find color in each and every day of your life, even in those that look grey .